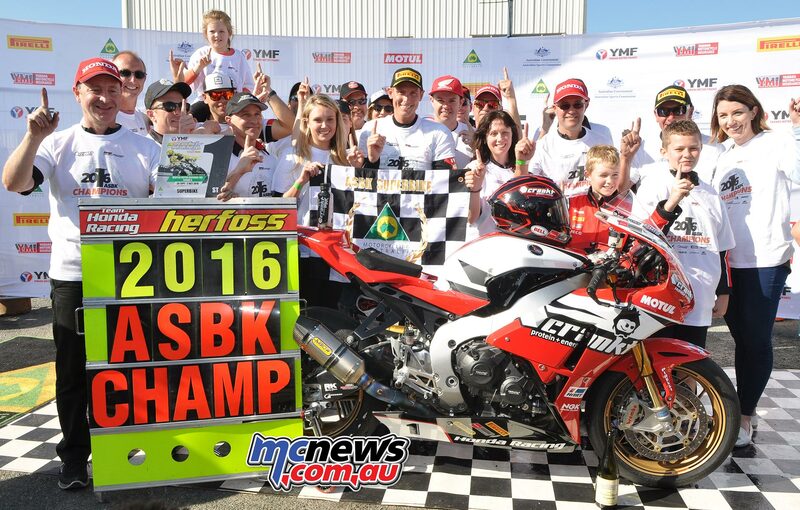 I will prelude this interview with Team Honda Racing’s Paul Free, by explaining this victory celebration shot taken at Winton Motor Raceway. 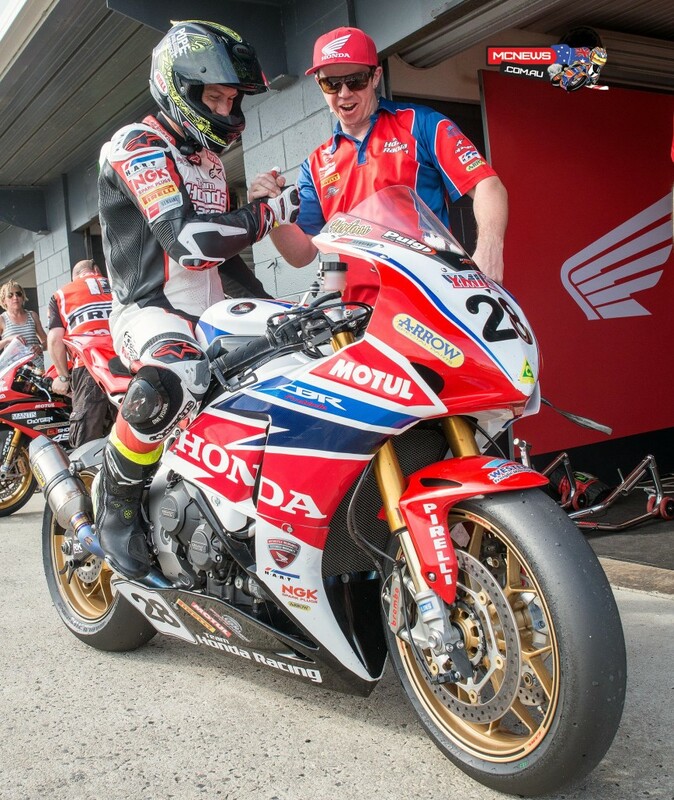 From this image a casual onlooker would think that there is a massive Team Honda Racing crew at the track. Nothing could be further from the truth. In reality, across recent seasons it has essentially just been the riders and a sum total of four, Paul Free, Shaun Clarke, Dan Williams and Glenn Granger. More recently that grew to a total of five with the addition of Adrian Monti. Every task at an event is generally completed by that small group of people, from washing the bikes to making the lunches. Paul drives the truck to the events, the whole team generally all stay together, eat together and socialise together when away at race meetings. 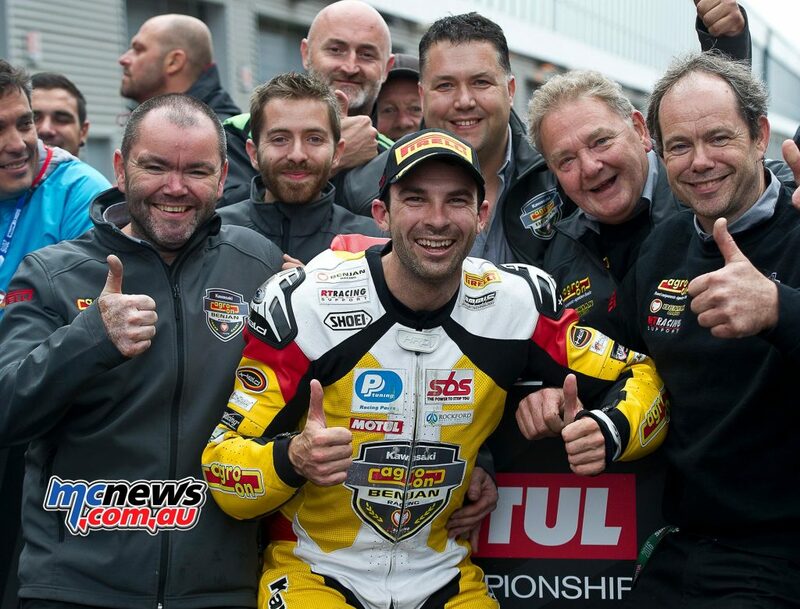 The other people in the image above are family and friends of team members, plus Glyn Griffiths representing Honda Motorcycles Australia, and Dave Fuller from Link International, Australian distributors of Pirelli motorcycle tyres. 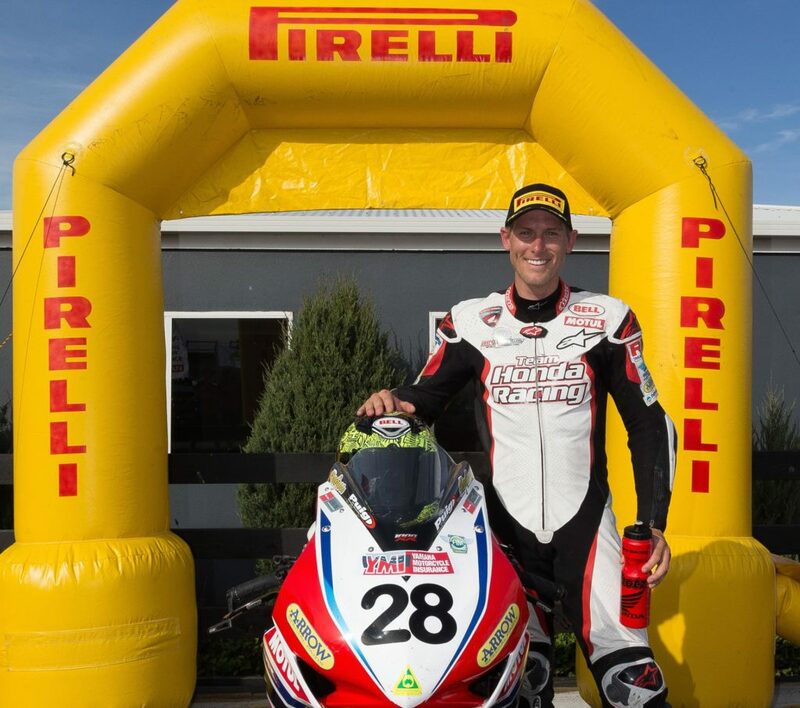 So Paul, back to back champions… The premier Championship last year, 2015 was of course the Swann Superbike Series, this season, with almost everyone opting back in to the M.A. 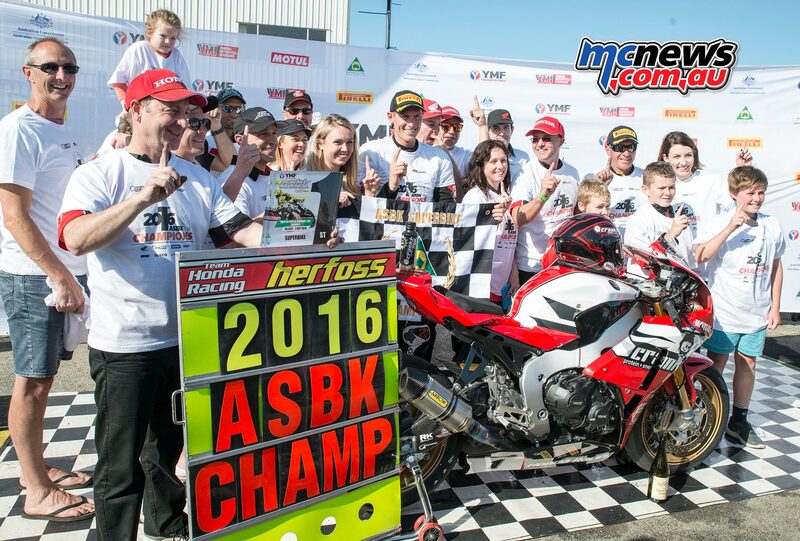 ratified ASBK for 2016, you won the main prize once again. It went down to the wire again, not quite as close as last time around, but in 2015 you were all on control tyres – Dunlops. This season you had the tyre war between Pirelli and Dunlop, and that ebbed and flowed throughout the year. You also mentioned recently about how Pirelli were really an integral part of how you managed to get across the line in the latter half of the season, how exactly did that come about? I’ve got to say, spending a bit of time in and out of your pit garage over the years, you’re a pretty stable crew in there now with Shaun, Dan, Glenn, and more recently also Adrian. Nothing ever really seems to get hurried, or stressed, it seems to always be a fairly calm sort of environment. 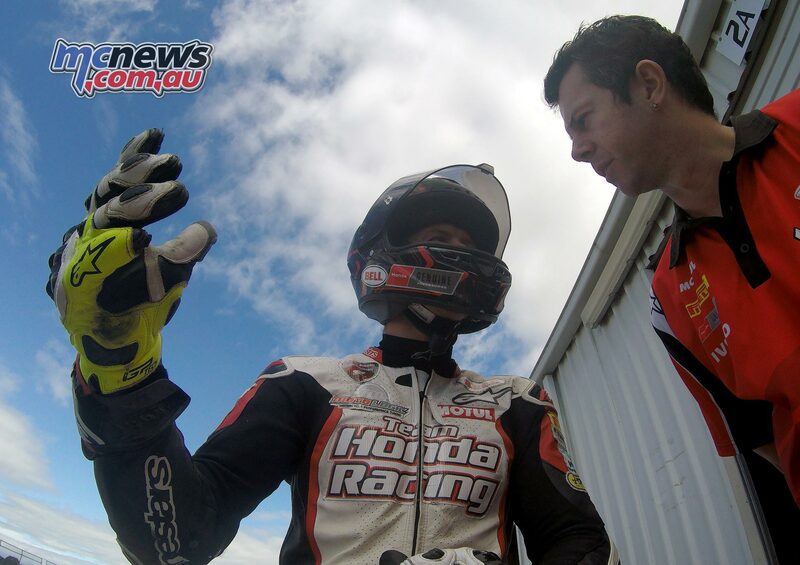 Of course you know when the pressure is on, as there wasn’t quite as much calmness at Winton – everybody was still controlled, but there was definitely some major tension and anticipation in the air. How do you go about with your job, managing all those guys, you don’t really seem to have to though… nobody really even seems to talk to each other all that much in the pit garage as such on a race weekend. They just go about what they are doing, no one seems to get told what to do. How have you managed to create that atmosphere? “It’s a culture I think. Some of those guys, like Shaun, have been with me since I pretty much started with Honda back in early 2000s. Glenn has been working with the team for a similar period of time, on a part time basis. Daniel joined the squad in 2010, after he shifted across with Jamie from another team. And there’s a new addition to the team – Adrian. It’s interesting to also witness the progress over the course of the seasons. I remember you telling me the other year, that one click is too much sometimes, sometimes you need half a click (of adjustment). 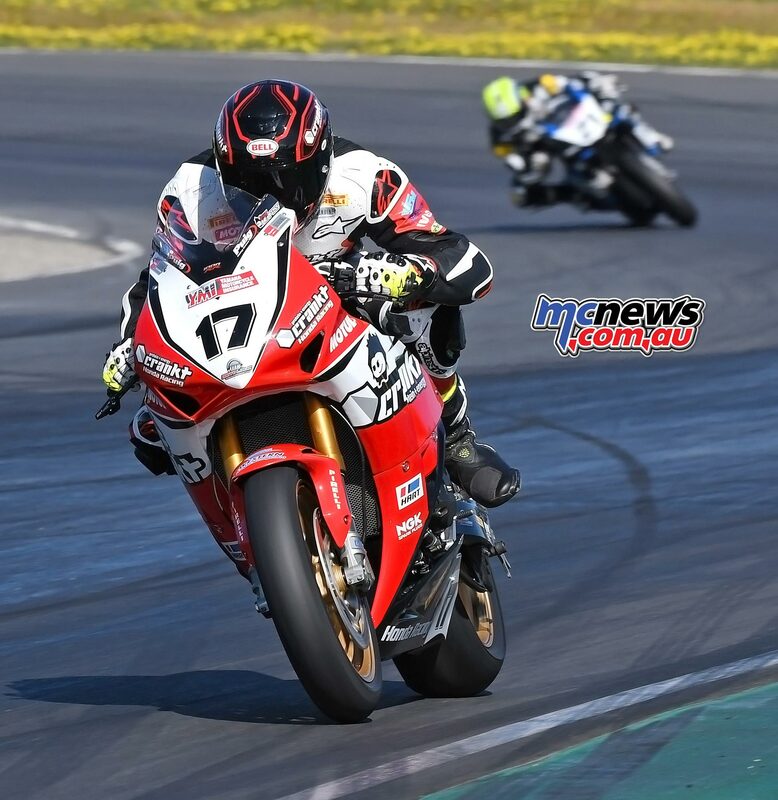 We saw on Sunday morning, that even though Troy had done so well at the test session the week before and dominated practice and qualifying, come Sunday morning, all of a sudden, it was out the window and the setup was all wrong, just because of a change in temperature and conditions. I mean to the average person it seems almost impossible that things like that could happen. Can you give us some insight into how that few degrees in track temp or conditions can completely blow your setup out of the water, and take you from almost certain race winning pace, to then struggling to even get on the podium? “There’s certain tracks that change a hell of a lot with temperature, time of the day, and such you know. You can also see with a motocross track that it changes so much and sometimes so fast with some circuits. 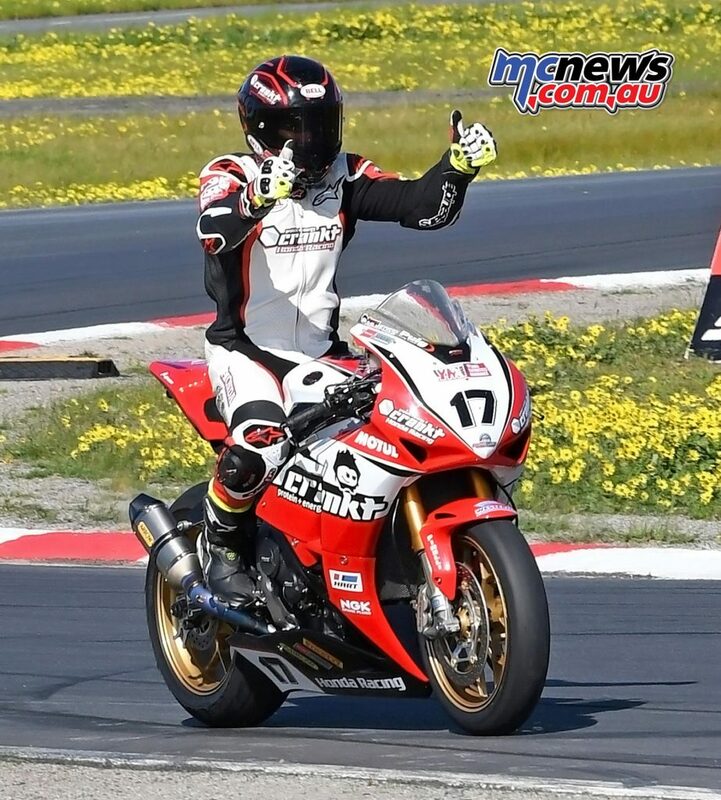 With Winton being so green with the new surface, I’d have to put it in perspective, as it’s the exact same compound at Winton now, as at Phillip Island. And we can all remember how abrasive it was when they first put that surface compound down at Phillip Island. 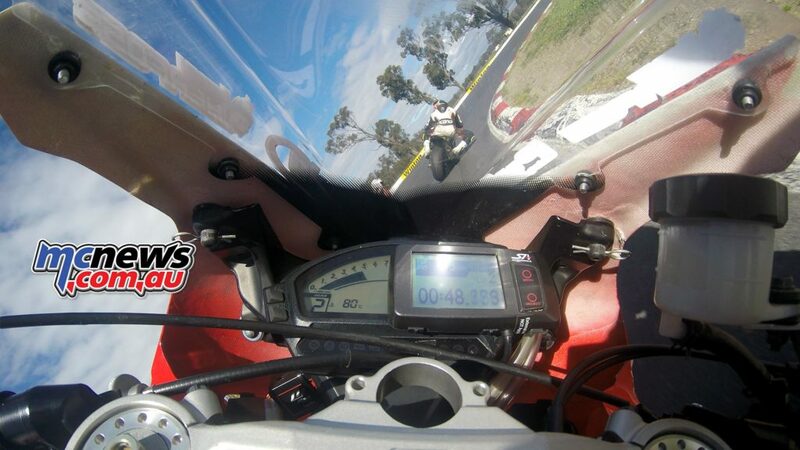 “That’s what we’re seeing at Winton. Winton used to polish tyres, now it just tears them to bits. So going from the test, where Troy did 20.4, not really trying that hard, we thought we were going to see 19s in the race event. The track changed so much in a week however that it was just incredible. When you say those changes, just to give us layman more of an insight what happens there, you’re talking beyond clickers and springs, you’re talking about disassembling parts and changing valving. Again for the layman, we’re talking about changing shim stacks and internals. Physical parts inside the suspension. It certainly did, and again the relief was palpable on everyone’s face. 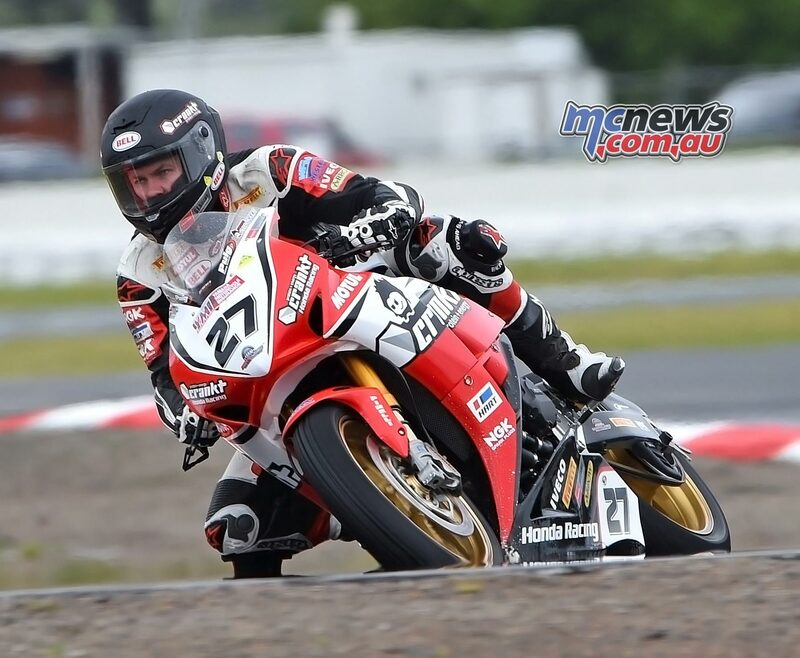 Troy managed to keep his pressure internal, but he was clearly a bundle of nerves that weekend of the ASBK final. He did his job and brought it home, and he has been virtually flawless this whole season. He has really come of age, hasn’t he? Now let’s move on to Jamie. 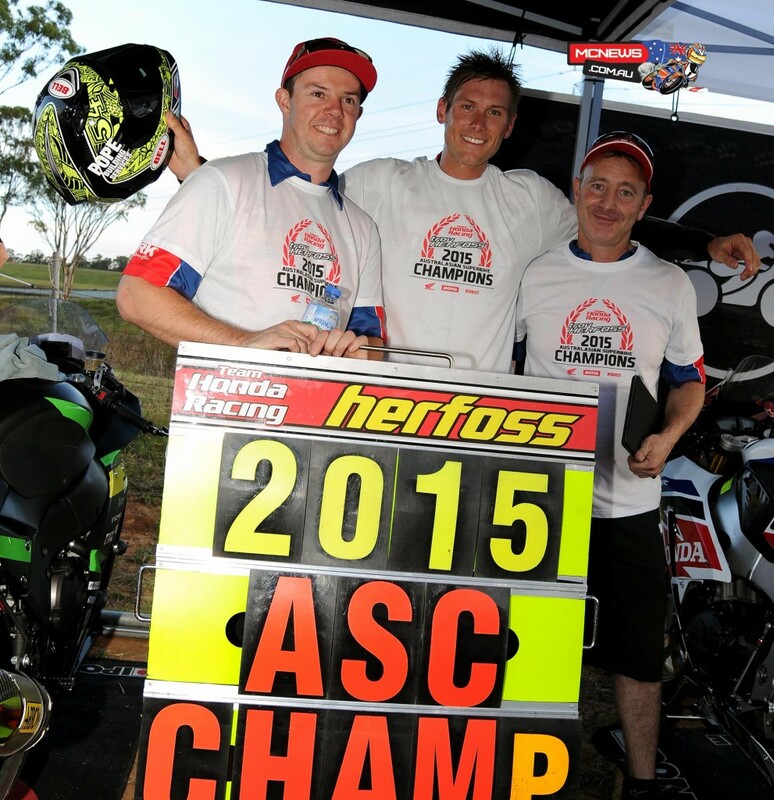 A fantastic champion and top bloke, who everyone has a lot of respect for. He has had a pretty tough couple of years, he’s had some massive crashes and when he’s had a crash he’s been really hurt. I didn’t think he would come back from a couple of them and remember questioning you at the beginning of this season, after his big crash, whether you thought he would give it away. But you mentioned that you’ve never seen him so determined to be on the motorbike and that Jamie was raring to go. “Jamie just loves riding the motorbike. He’s admitted that those big crashes have hurt his confidence a fair bit, at this point Jamie is not going to continue with Honda’s main team for 2017. I believe it is likely Jamie will hang up the boots, it’s just a culmination of all those injuries and setbacks that he’s had over the last couple of seasons. You know I think that I said to Jamie, ‘I can’t stand to see you get hurt anymore, Jamie’. He’s become a really, really close friend as much as a rider for our team, and it really pains me to see him get injured. You know I don’t mind if they fall off, but when they are getting hurt like that, it hurts me a lot. And you’re welcoming back Bryan Staring after a long stint in Europe – in your Motologic office in Cambellfield I saw a picture of Bryan Staring on one of your bikes from quite a few years ago. Bryan has had his ups and downs in Europe and almost lost the lower half of his leg with that practice accident earlier in the year. 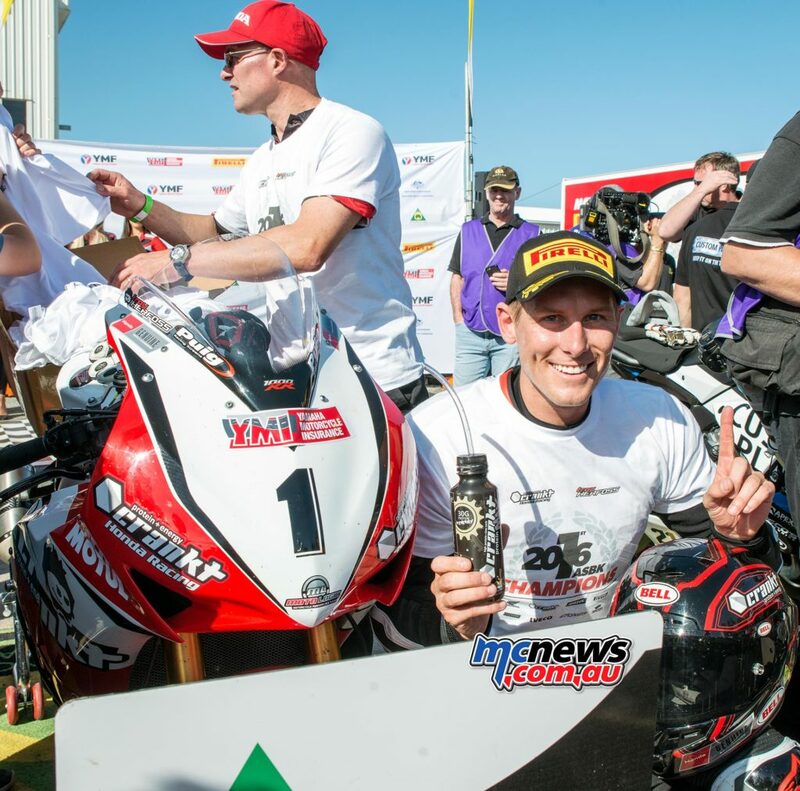 He got back on the bike recently in the European STK1000 and in the wet managed to score a podium on a non-competitive bike, after what’s been an incredibly tough six months. 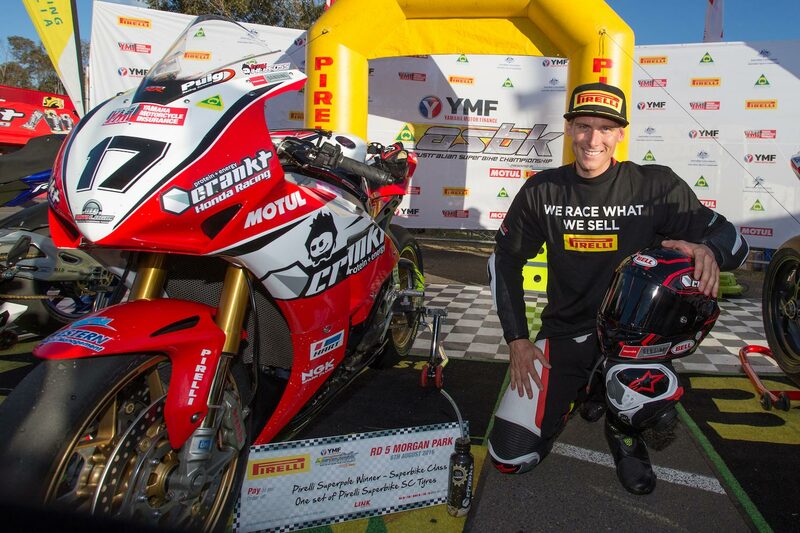 When do you see Bryan jumping on a Crankt Protein Honda Fireblade.